For all the super-powerful flagship Android handsets out there, the OS gained popularity because it's traditionally been a cheaper alternative to the priciness of Apple's iPhone. 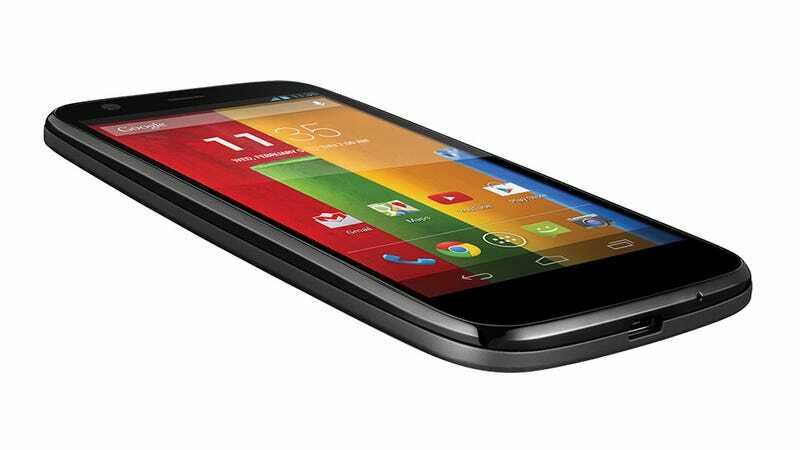 With that in mind, here's the Motorola Moto G, a solid Android phone that'll be available off-contract for just $180. So here's the spec breakdown: $180 gets you the 8GB Moto G. For just $200, you can upgrade to the 16GB model. The phone has a 4.5-inch 1280x720 (329 PPI) display. It runs the "newest" Snapdragon 400 processor clocked at 1.2 GHz. Perhaps most importantly, by the time the phone hits the US, it'll come running Android 4.4 KitKat. As for that US drop date, it won't be here until early 2014. The Moto G will roll out over the next few weeks to Latin America, Europe, Canada, and parts of Asia. Downsides of the phone are that it doesn't have LTE support and it doesn't have always-on listening like the Moto X does. There's also a lot we don't know, like details about the phone's dual cameras.